A new Shepard play premieres in Ireland! Dublin's Abbey Theatre will host the premiere of KICKING A DEAD HORSE, written and directed by Sam. The theatre has given no details about the plot of the new play, which opens March 15 and runs through April 14, but they have announced that Irish thespian Stephen Rea will star. Abbey director Fiach Mac Conghail has been cultivating a relationship with Shepard recently. The theater staged a production of his TRUE WEST last year. The Sarah Michelle Gellar thriller, THE RETURN opened November 10th in nearly 2,000 theatres pulling in a weak $4.8 million. To date it has grossed another $3 million. Of course, it doesn't help that BORAT is ruling at the box office! A spokesman for the distributor, Rogue Pictures, termed the figure "very disappointing. He noted that Gellar's core audience of suburban girls showed up, and the Latino contingent was also heavy because of the spiritual content. The movie had not been screend beforehand for critics, generally a sign the distributor expects bad news. Though it did not cost a fortune - it was made for under $15 million - and could eventually recover its cost, it was still an underperformer, especially when one remembers that horror films usually open big in North America, many grossing $20 million in three days. Frank Scheck of The Hollywood Reporter sums up the typical review - "While Adam Sussman's screenplay can be admired for its emphasis on subtle atmospherics rather than cheap scares, it is a gimmicky slog of an affair that lacks narrative coherence or strong focus... Kapadia's helming is similarly lacking in sharpness, though he and cinematographer Roman Osin have at least provided a distinctive, bleached-out visual style that well exploits the barren Texas locations... Shepard provides his thankless role with his usual gravitas." According to the Hollywood Reporter, Sam has been cast in the Uma Thurman romantic comedy, THE ACCIDENTAL HUSBAND. The independent film from Yari Film Group begins shooting today in New York under the direction of Griffin Dunne. Two writing teams crafted the screenplay: Mimi Hare and Clare Naylor, and Kristen Buckley and Brian Regan. The film follows a local talk radio host (Thurman) with a show about relationships. Colin Firth will play her husband and Sam will play her father. When one of her listeners follows her advice and breaks up with her boyfriend, a NY fireman, the boyfriend plans his revenge and set Emma's life into crisis. Other cast members include Jeffrey Dean Morgan, Isabella Rossellini, Lindsay Sloane and Justina Machado. IGN recently interviewed Asif Kapadia, director of THE RETURN, who discussed his upcoming film. He reiterated the fact that there's less dialogue and "it's more of a story that's being told visually." 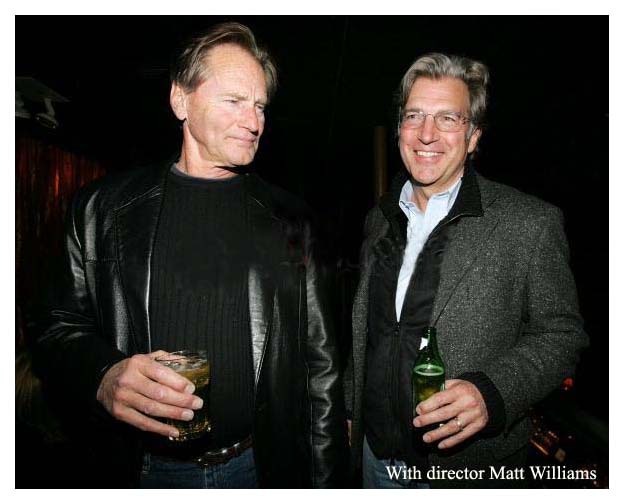 When IGN describes Sam Shepard as being such a presence, Kapadia responds, "He is. He brings a wonderful presence, and he does it with such small gestures." IGN then compares him to Steve McQueen where his characters would speak through the simplest of gestures, such as just shifting his eyes. Kapadia responds, "That's what Sam does. Everything means something and he has it down to an art. It's an awareness that some actors have. He really has a natural ability for it. It's delicate. But you know, Sam's a tough guy, too. He gives the impression of no nonsense. He can get into a scene and straighten it out by being so aware and subtly reactive." February release for JESSE JAMES??? 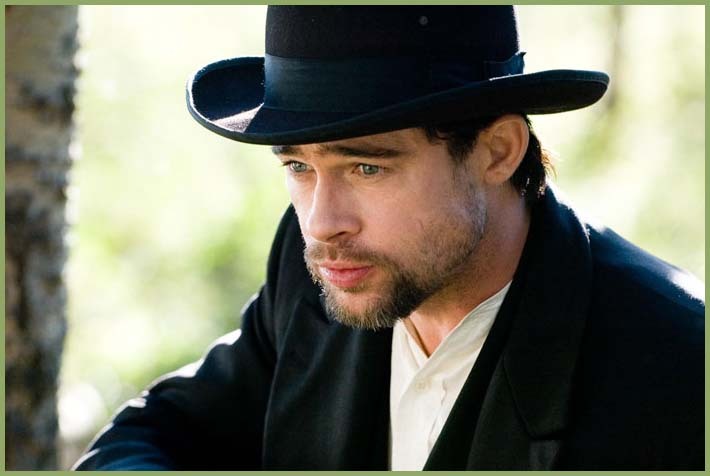 Tony Scott, one of the producers of THE ASSASSINATION OF JESSE JAMES BY THE COWARD ROBERT FORD, told Kevin Williamson of the Calgary Sun that the film will open in February. When questioned about the delay in releasing the film and how that often sends a message of a troubled production, Scott replied, "Not so. It's great. We have to be careful how we market it because it's like a Terrence Malick film. But it's really good and Brad's (Pitt) terrific in it. He just gets better with age." I've also learned that in a recent interview in UK's Uncut magazine, Patti Smith talks about releasing a covers album for 2007 due out in late March or early April. She doesn't divulge any song titles as yet but the artists range from Jefferson Airplane to Gene Clack to Tim Buckley, Jimi Hendrix and Nirvana. She says her son and daughter will play on the album along with Flea, Paul Simonon and guess who, Sam Shepard possibly on drums! 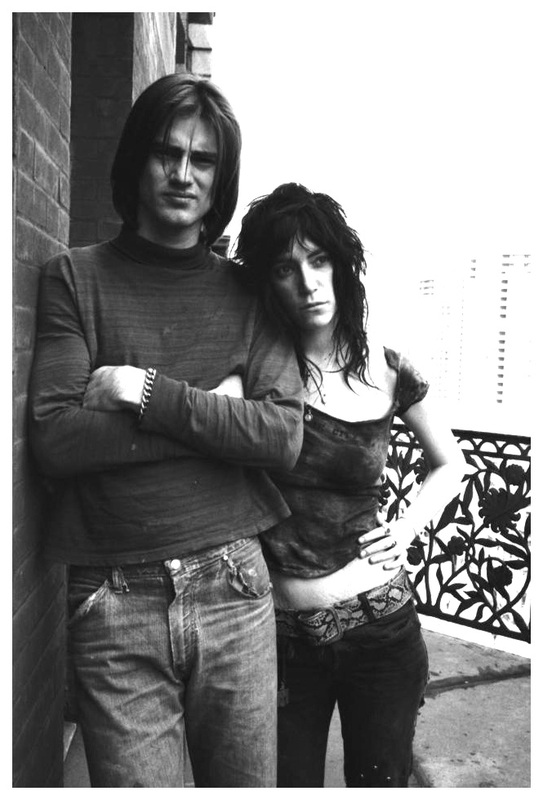 The Smith/Shepard connection goes back to 1971 when the lovestruck couple wrote COWBOY MOUTH. 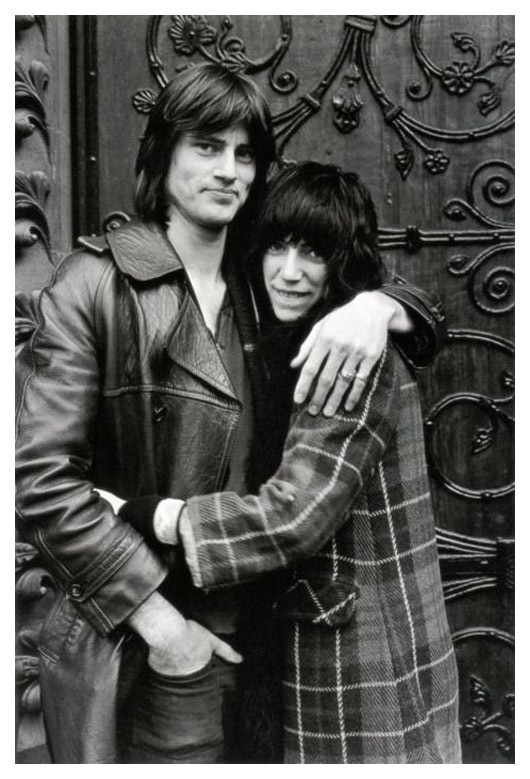 Patti adds, "We want to do a record that pays homage to the people that I have admired and songs I love lyrically. It's Volume 1 of my thank you's." For those of you who are unaware of Sam's musical talents as both a songwriter and drummer, let it be known that he has had some interesting associations with major rock performers, such as Bob Dylan. Back in 1967 he played the drums on the Holy Modal Rounders' album, "Indian War Whoop." Apparently Sam is not on the original LP cover shot because as a statement against the hippie era, he had just gotten a crewcut at the height of the Summer of Love. Record ESP owner, Bernard Stollman, would not put him on the sleeve believing it was the wrong haircut for the band's image. The CD became available when the album was reissued in 1999. 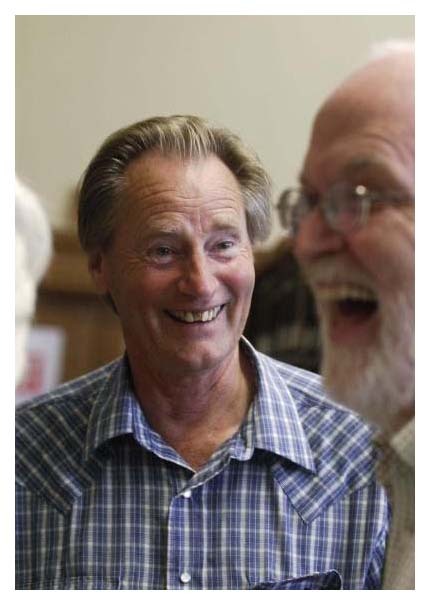 Today is Sam's 63rd birthday and this web site celebrates its first anniversary! Thanks to a few blogs on the Net, I was able to gather some information about the reading at the 92Y on Thursday evening. Philip Seymour Hoffman was chosen to introduce Sam. The connection? Hoffman played opposite John C. Reilly in the 2000 Broadway revival of TRUE WEST. The Oscar winner first recounted a funny story about the time he and Reilly were rehearsing for the play when the playwright was present and at one point they looked over and found Sam had actually fallen asleep. Hoffman said, "We were both like 'wow... f***... that's bad.'" Before exiting the stage, he asked the audience, “Isn’t it cool that we’re living in the time when Sam Shepard is living!" According to reports, Sam read from a scene in TRUE WEST and then read some new short stories, so I assume his new work in 2008 will be the publication of them. One story centered on a teenager who was trying to interview his father for a class project about the 1980s while another story was about a man watching the ending of THE THIRD MAN with his wife. I've added some new photos from the Sarah Michelle Gellar thriller, which opens on Friday. The only ones with Sam that I've come across are these two magazines photos. In the latest issue of Sci Fi magazine, director Asif Kapadia talks about film production - "We got a really brilliant cast together. I really loved working with them. It was an amazing group of people, and for me, it was just a matter of pushing them and letting them do their thing. There were no complications, and they understood where I was coming from and trusted me to get on with it and take them where they needed to go. And Sam Shepard is a hero and an amazing guy." And in Fangoria magazine, he indicates that both Sam and Sarah were offered the screenplay and never came in to read. When Kapadia was asked what it was like working with the notoriously reticent Shepard, he shrugged, "It wasn't that intimidating. We were all professionals trying to make the best movie together, although I have to confess there was a certain excitement in the air when Sam was on set. The crew loved him. He's a legend!" And coincidentally, the director admitted that BADLANDS, DAYS OF HEAVEN and PARIS, TEXAS had particularly influenced him in the making of THE RETURN. Just a reminder that Sam will be doing a reading at the Unterberg Poetry Center at 92nd Street Y in NYC tomorrow evening at 8 pm. He will read from his latest but as yet unpublished work of fiction. Its title, subject and form still unannounced, the new work is to be published by Knopf in 2008. 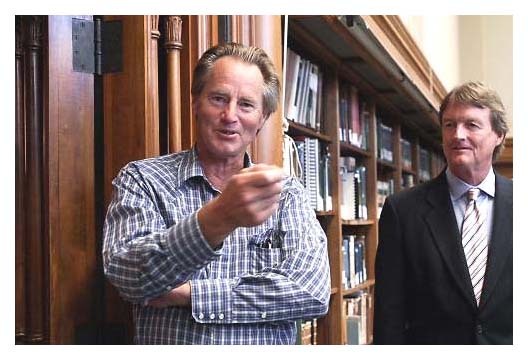 Sam will share the evening with a friend, sometime collaborator and fellow Pulitzer Prize winner, Richard Ford, who will read from his recently published novel, “The Lay of the Land." The pair previously appeared together at the Poetry Center in 1997. According to the Hollywood Reporter, Sam will be starring in the film DESCENDING FROM HEAVEN: THE STRANGE AND EXTRAORDINARY TALE OF CLAUDE EATHERLY, A-BOMB PILOT. Another long title - hope they shorten this one too. Claude Eatherly was the pilot who flew the reconnaissance B-29 that gave the okay to drop the bomb on Hiroshima on August 6, 1945. Sam will play Claude's father. Sandy Smolan will direct the $10 million feature. I'm not sure if this is supposed to be an anti-nuclear film but here's a little background on Eatherly. He was discharged from the Air Force two years later for cheating on an exam and went on to spend the next 17 years in and out of jail and in psychiatric hospitals. Some folks wondered if his problems might be related to possible guilt for his role in the nuclear holocaust. Not so. Two books have been written on Eatherly and both authors believe the ex-pilot was using the media to get publicity as well as funds from the VA to support a gambling habit and lifestyle that he otherwise could not afford. They don't deny that he was mental, but question whether his psychiatric problems were related to the Hiroshima bombing. In fact, after Eatherly died in 1978, Eatherly's first wife claimed that his problems stemmed from disappointment over not being chosen to drop the first atomic bomb! Interviews with his flight crew support her statement as well. No production date has been set yet. Suicide in B-Flat, Hayworth Theatre, Los Angeles, playing October 20 thru November 18. Cowboy Mouth, Exit on Taylor, San Francisco, playing October 19-21. True West, Vermont Stage, Burlington, VT, playing October 11-29. True West, Lord Leebrick Theatre, Eugene, OR, playing October 20-21. Buried Child, The Access Theater, NYC, playing October 4-22. 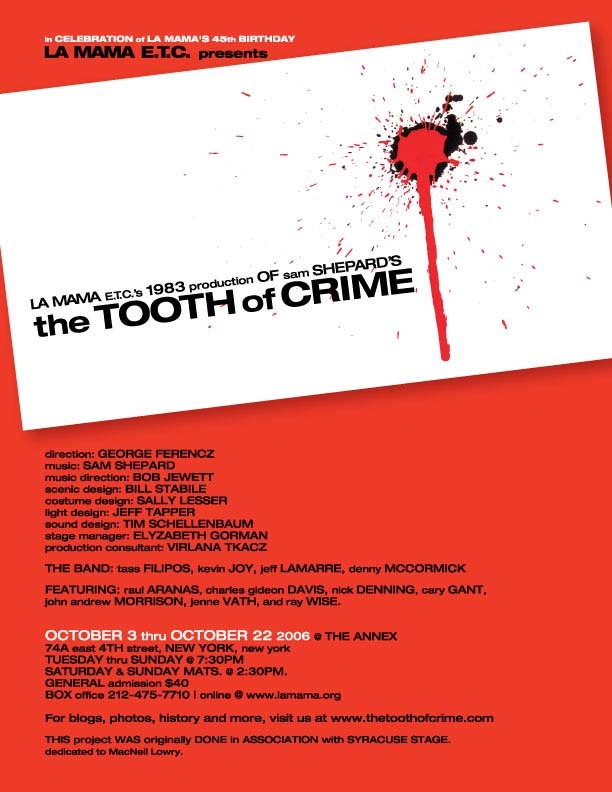 The Tooth of Crime, LaMaMa, Etc., NYC, playing October 3-22. The God of Hell, Magic Theatre, San Francisco, playing September 23-October 22. Shaved Splits, Michael Chekhov Theatre, playing October 15-16. Seduced, Michael Chekhov Theatre, playing October 22 & 29. Yes, Sam is back in the saddle again. This comedy western, written by Luc Besson and starring Salma Hayek and Penelope Cruz, premiered in France on January 18, 2006. It opened a month later in Mexico (where it was filmed), and then had a theatrical release in several other countries, mostly European. No reason was given as to why there was such a delay in showing it in the US. It was supposed to open on September 22 in 1500+ locations, but instead it had a limited release on that day. Apparently the Cinema Latino theatres struck a deal recently with 20th Century Fox and showed it in several of their theatres in California, Texas and Arizona. Hayek and Cruz star as two very different women in turn-of-the-century Mexico who become bank robbers in an effort to combat a ruthless enforcer terrorizing their town. Sam plays their mentor, Bill Buck, who shares his expertise in robbery with the charming duo. At this point, I'd guess that your best chance to see BANDIDAS would be renting/purchasing the eventual DVD release. The film's producer, Ariel Zeitoun, relates this humorous story about Sam. "When I went to pick him up at the airport in Durango, I arrived late. I found him outside sitting on his bag, as if it were a saddle, wearing boots, jeans and a cowboy hat. He got into the car without a word and we made our way in silence in the setting sunlight. With his eyes closed, Sam appeared to be sleeping. When arriving in Durango, without opening his eyes, he murmured, 'I wonder what I'm doing here - filming a western by the French and directed by Norwegians! '"Yes, it's a Luc Besson film directed by Joachim Roenning and Espen Sandberg in their feature-film debut. 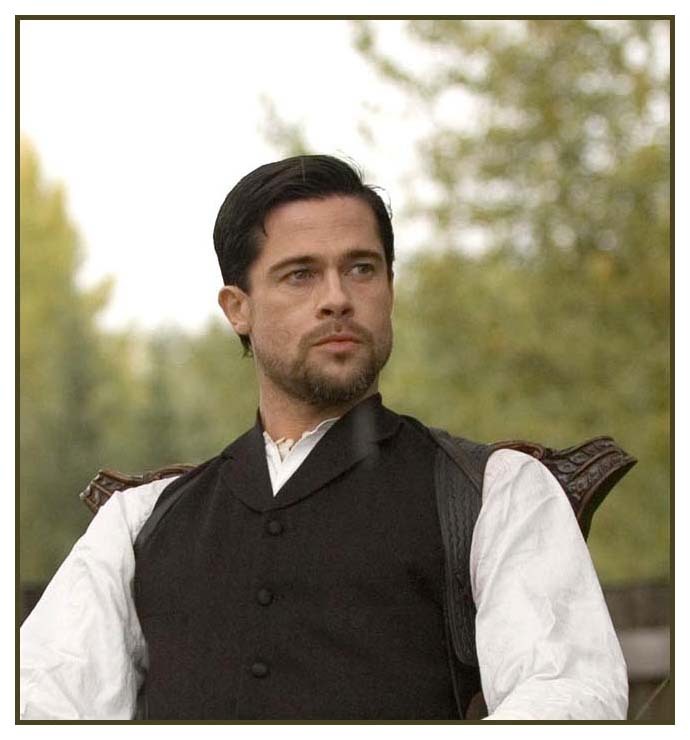 According to an article from Guns magazine, THE ASSASSINATION OF JESSE JAMES BY THE COWARD ROBERT FORD will hit the big screen in the spring. And if you're looking for a wild shoot-em-up in the old pattern of THE WILD BUNCH, you won't find it here. Instead, the movie is relying on character development and interplay with the gunfighting scenes sharp, short and furious. Journalist Mike Venturino notes that authenticity was a priority when it came to the firearms and gun leather used in the film. Look for Sam carrying a nickel-plated Remington Model 1875. Sources report that Australian director Andrew Dominik has created a highly stylized film noir. After working with two set designers, Dominik finally found the dark look for which he was looking. The western reportedly features no cowboy boots or cowboy hats, only black horses, mostly black clothing and even a black goatee for Pitt. In the April issue of Cowboys and Indians, Sam gives his take on the film, "For some reason, these Australians have a great feel for the Western. You know, it was an Australian who did LONESOME DOVE. So I think this could be a real good movie. 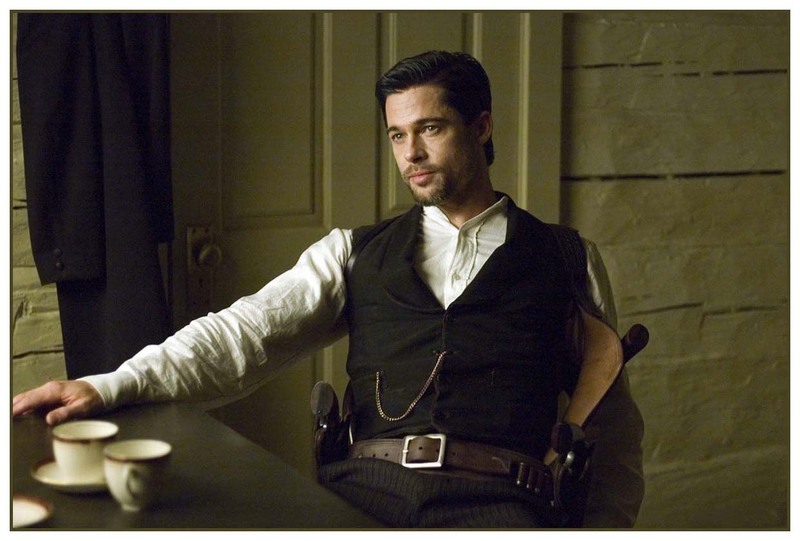 It's got all the earmarks of being a classic Western." 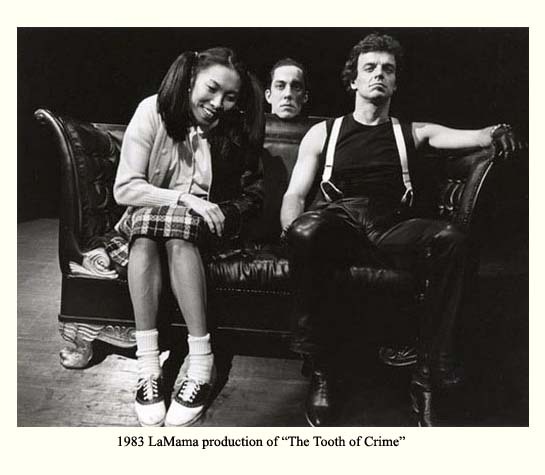 At LaMaMa owner Ellen Stewart's request, Sam allowed one more production to be staged with the original script of his 1972 play, THE TOOTH OF CRIME. I've tried to encourage people to use the newer version," Sam said in a recent interview, "But seeing how it was Ellen asking... She was very generous to me. She gave me a job when I desperately needed one. It was the original LaMaMa. I was serving hot chocolate to the audience." That was back in the early 1960's when the young playwright was struggling. "Tooth" opened last week as part of LaMaMa's 45th anniversary celebration and will play through October 22. Andy Propst of the Village Voice probably had the most enthusiastic review with "'Tooth' is thrilling theater that engages intellectually, emotionally, and viscerally." The remaining critics all seem to agree with Variety's Marilyn Stasio that "the show feels caught in a time warp, faithful to the ideas and theatrical style - but not the driving energy - that made it such a galvanic experience way back when." Rob Kendt of Newsday echoes that with "a tentative weariness has crept into the old moves" failing to re-create the frisson of the 1983 production. 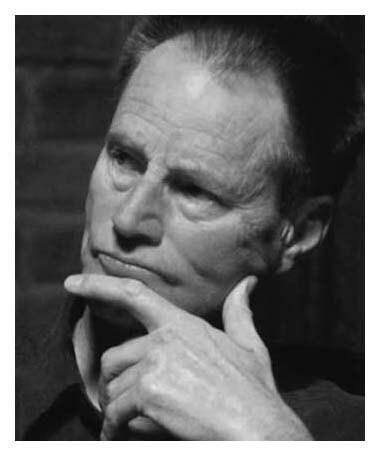 Interestingly, he writes, "Sam Shepard is the closest the American theater has ever had to a rock-star playwright - not so much in terms of his fame, which has more to do with his film acting than his Pulitzer Prize, as in terms of his subjects and style. In the 1970s, his plays blurred the lines between theater and music in fresh and invigorating ways. Long before hip-hop, Shepard was sampling gangster chic and outlaw individualism, linking both to the dog-eat-dog logic of U.S. capitalism." Frank Scheck of the NY Post writes, "While this revival clearly has a sentimental resonance for its creators and for those who may have seen it 20 years ago, the play now comes across as a museum piece of experimental writing that hasn't aged particularly well. And director George Ferencz's concept of staging it in rock-concert fashion also has a by-now familiar air." However, Scheck believes the play still has its moments of power. NY Times theatre critic, Ben Brantley (and long-time admirer), agrees overall, but he also pays homage. He writes, "It is both gratifying and a little frightening when a play you had consigned to the crypt returns as a living prophecy for our times. La MaMa E.T.C.’s highly entertaining new revival may not be the slickest show around. But as directed by George Ferencz, in a restaging of his 1983 concert-style production for La MaMa, this 'Tooth' achieves something far more important than professional perfection." Brantley points out that Sam was only 28 when he wrote this play, long before becoming a celebrated playright or film star, and yet he had this "sharp and harrowing sense of how success blurs the borders of identity and how image can devour creativity." First Photo of Sam from "JESSE JAMES"
The Magic Theatre, the legendary San Francisco theater company known for its production of original and edgy drama, celebrates its 40th year with the bay area's premiere of THE GOD OF HELL, running from Sept. 23 through Oct. 22. Amy Glazer directs the unflinching ode to the current adminstration. Written by Shepard to affect the outcome of the 2004 Presidential election, this dark political comedy will run in the wake of the November elections. The play features a notable Bay Area cast: Anne Darragh and John Flanagan play the farmer couple, Jackson Davis is Mr. Haines, their unsuspecting neighbor and Michael Santo rounds out the cast as the salesman. Magic's Artistic Director, Chris Smith, says, "The play’s like a primal scream set in the heartland of America at the moment when patriotism has become a cancer. The laconic poetry and absurdist touches make it quintessential Shepard." Randy Quaid, J. Smith-Cameron, Frank Wood and Tim Roth starred in the world premiere of THE GOD OF HELL at the Actors Studio Drama School Theatre in New York. Lou Jacob directed the Off-Broadway production which ran in November 2004. The work has since played in London at the Donmar Warehouse and Los Angeles at the Geffen Playhouse. Interim Dean of the College of Fine Arts Doug Dempster: “Sam Shepard is an American original, a vision and voice that for 40 years has been unconfined by genre or convention. The University of Texas at Austin is thrilled to have the Shepard archive available for research and for use in our theatre and play writing programs." Bob Schmidt, interim chair of the Department of Theater and Dance: "He is a rather unique artist in that he is not only a playwright of great note, but an actor, a film writer and a poet. A lot of the interest behind him goes beyond just theater and into the broader arts. His work is distinctly American in that it deals with a lot of contemporary issues in American society. That is the defining feature of his dramatic work." Dr. Kurt Heinzelman, professor of literature and creative writing at The University of Texas at Austin and member of the Libraries advisory council: “I consider Sam Shepard to be one of the most important figures of his generation, and his archive represents significant work from all phases of Shepard’s artistic life—theater, film, music, poetry, journalism and short fiction. This is also an archive for the future, because it entails the promise that Shepard’s subsequent work will also become a part of the University Libraries’ collection." Although most of his archives reside at Texas State University in San Marcos (and a few more pieces can be found at the University of Virginia and the University of Delaware), UT's Fine Arts Library will hold material from his later career, roughly from the late 1970s on. Among the materials: manuscripts and scripts for plays and films including such as "The Tooth of Crime," "Don't Come Knocking," "Black Hawk Down" and the upcoming "The Assassination of Jesse James by the Coward Robert Ford." 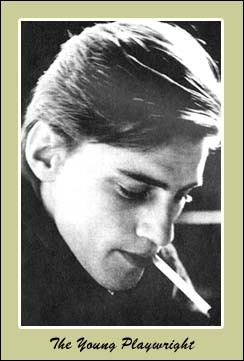 Shepards' correspondence with German director Wim Wenders is also included. Other notable pieces include a cigarette case with a note from Sean Penn; Polaroids from the set of "The Right Stuff," a script from a play he was in - " Number," with all his hand-written notes from rehearsals; and a gallery proof from his work with Bob Dylan. Shepard's copy of the Pulitzer Prize-winning drama "Buried Child" became the nine-millionth volume held by UT's libraries. LaMaMa, one of New York's most famous experimental theatres, will present the rarely-staged Sam Shepard play THE TOOTH OF CRIME during its 45th anniversary season, according to THE NEW YORK TIMES. Previews will begin October 3rd, and the show will run through October 22nd. It will be staged in its original version; Shepard rewrote it in 1997 as THE TOOTH OF CRIME (SECOND DANCE), and theatre companies have only been able to present that revision. Shepard has allowed one more performance of the play as originally written. THE TOOTH OF CRIME, which had its New York premiere in 1972, was previously seen at LaMaMa in 1983. The work, which concerns a battle for supremacy between an aging rock star and an ambitious newcomer, was staged by George Ferencz - to critical acclaim as a rock concert. Ferencz will also direct the new version this season. 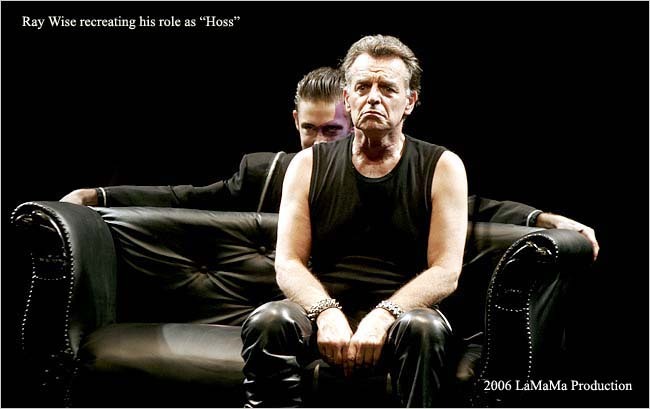 Ray Wise will return as Hoss, the older rock star. He won an Obie for his performance in that role in 1983. The production will feature music by Shepard. Sony Pictures Home Entertainment released the DVD of DON'T COME KNOCKING on August 8. Features include Wim Wenders audio commentary, deleted scenes, the New York premiere featurette, the Sundance featurette, and interview with Wim Wenders and Eva Marie Saint. It's a bit disappointing that the extra features don't include an interview with Sam since it was a Wenders/Shepard collaboration. NY's Michael Chekhov Theatre Company opened their new home at The Big Little Theatre on March 15 with three Shepard plays and their "Sam Shepard Festival" is ongoing. The theatre, founded by Michael Horn, is attempting the herculean task of presenting all 45 of Sam's plays over a two-year period. It will be the first time in world history that all of his plays have been produced in one place. Clicking on their logo to the right will take you to the theatre's web site. The upcoming supernatural thriller, THE RETURN, is scheduled for release on November 10. 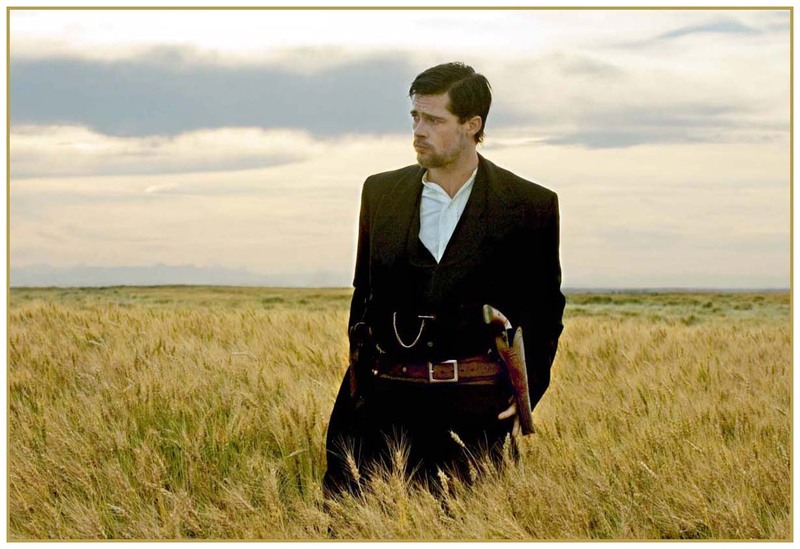 Produced by Rogue Pictures, it stars Sarah Michelle Gellar , Kate Beahan, Peter O Brien, Adam Scott and Sam Shepard. Gellar plays Joanna Mills, a tough young Midwesterner determined to learn the truth behind the increasingly terrifying supernatural visions that have been haunting her. Joanna has made a successful career for herself, as sales representative for a trucking company. 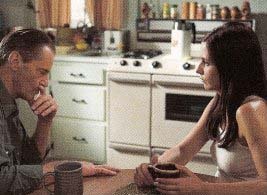 But her private life has been difficult; estranged from her father (Sam Shepard), stalked by an obsessed ex-boyfriend (Adam Scott), and with few friends, Joanna fears that she is losing control. She sees and feels the brutal murder of a young woman she s never met, at the hands of a heartless killer - a man who appears to be making Joanna his next target. Determined to fight back, Joanna is guided by her nightmares to the murdered woman s hometown. Once there, she will discover that some secrets can't be buried; some spirits never die; and that the murder she is trying to solve may be her own. 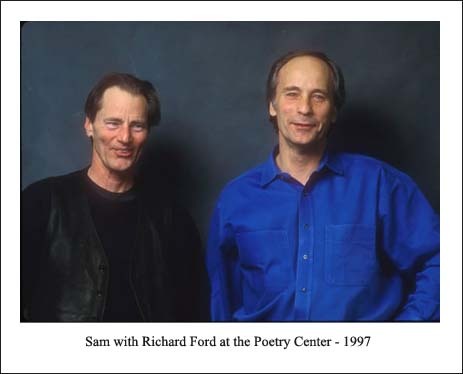 Richard Ford and Sam Shepard will return to the Unterberg Poetry Center at 92nd Street Y for the first time since their joint appearance in 1997. The event is scheduled for Thursday, November 2 at 8 pm. The 92nd Street Y is a multifaceted cultural institution and community center. According to the Charleston Business Journal, what drew Sam (a horse lover himself) to taking on the role of Frank Whitley in the telefilm, RUFFIAN, was Whitley's approach to training and personal style. "There’s a particular kind of individual in the horse-racing game that’s known as a ‘hard boot trainer,'" he explained. "It’s kind of considered old-fashioned now, I guess, but they were people who swore by clean water and oats and bringing the horse along as naturally as possible. For example, Ruffian never had shoes on until she got to the racetrack for the first time. The other thing is, trainers in Whitely’s day were very hands-on. Today, trainers have these huge operations, relying on assistants to work with 250 horses at a time. These old timers would have, at most, 20 horses in their barns." And in other news, Bill Nack, the horseracing reporter (played by Frank Whalley in the film) was quoted as saying, "Sam is doing a great job slipping inside Frank's shoes---and actor Frank Whaley has done a superb job of playing me back in the days when I was a Newsday reporter covering racing in New York." Not a Shepard tribute but a scam! 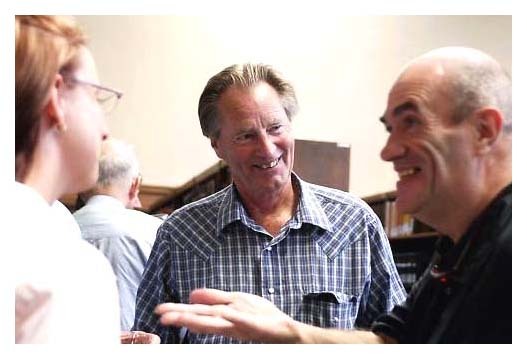 There's a web site called "A Tribute to Sam Shepard" that sadly is not a tribute but a money-making scheme for products related to Sam such as books, DVDs, videos and posters. What a sham! I assume the owner has perhaps capitalized on other celebrities as well. I had originally attempted to purchase "samshepard.net" but discovered the domain name had been bought two years ago. Coal mining country came to the big screen at the Tribeca Film Festival when WALKER PAYNE had its world premiere on Wednesday, April 26. Attending the screening were Sam, director Matt Williams and cast members Gabrielle Brennan and Chelsea Lopez. Film critic Logan Hill of New York Metro wasn't too keen on the film, but gave praise to Shepard - " Looking better than ever—wrinkles etched all over his legendary face—the playwright-actor delivers one of his most elemental performances. Dressed in a too-tight suit and snakeskin boots, Shepard plays the classic “stranger comes to town,” a con artist who chews on his scams like they’re plugs of tobacco. He’s more Pan than hustler, a trickster who starts a nasty world of trouble, and generates the film's one unforgettable shot: Standing on the pitcher’s mound of a small town’s empty baseball field, Shepard shuffles his boots in the dirt and stares up into the dirty stadium lights, tuning that deep, Western-loving voice to the primal rhythm of some old soulful hymn. As that sinner who can’t help but sing, Shepard—in this one beautiful scene, at least—stands straight and skinny as a kind of prototypical American man, crooked to the core but practically regal." 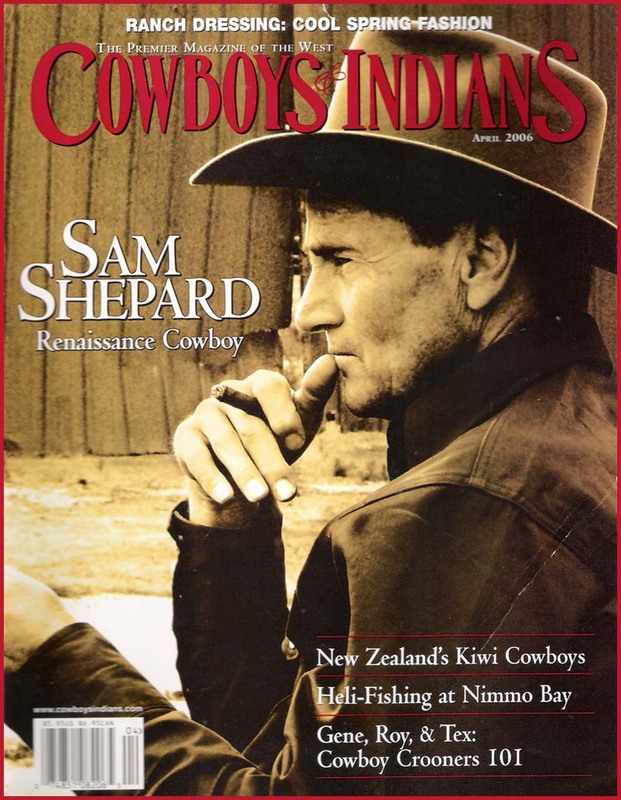 You'll find Sam on the cover of the April 2006 edition of COWBOYS & INDIANS magazine. The photo they use is actually from the set of DON'T COME KNOCKING. The introduction reads - "The award-winning actor-playwright has been called 'The Elusive Cowboy of the American Theatre' and 'Gary Cooper in Denim.' 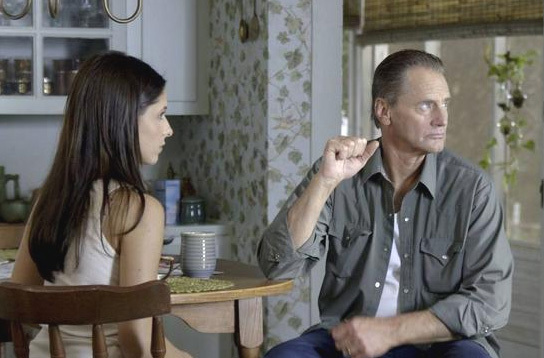 Sam Shepard's career continues to thrive with new western roles opposite Salma Hayek, Penelope Cruz, and Brad Pitt." When asked what film he was most proud of from a creative standpoint, it was no surprise. 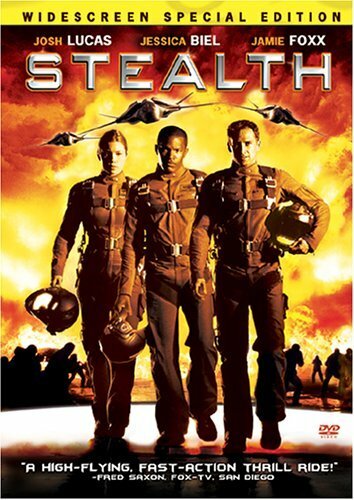 "I was never in a blockbuster, but the one that I really enjoyed and the one I think everybody involved in enjoyed was THE RIGHT STUFF, where I played Chuck Yeager. Everything about that film was a lot of fun. I got to ride a horse. I had a big roan - a bow-legged rope horse. It was just a hell of a lot of fun to do that movie and kind of an honor to play that man who's become such a legend over the years." On March 17 six theatres in LA and NYC screened the Wenders/Shepard film, DON'T COME KNOCKING, which then opened in 16 more theatres the second week in various US cities. With a gross close to $75,000, it received very mixed reviews, attaining a 42% on the infamous Tomatometer. It will continue to show up in arthouses over the next several weeks, so look for it in your local area. You could tell film critic Roger Ebert wanted to give it high marks but ultimately gave it 2.5 stars. He wrote, "Does every moment of a movie have to work for you? Or can you enjoy an imperfect one if it fills in places around the edges of your imagination?" On the positive side, he added, "The cinematography by Franz Lustig looks wonderful from beginning to end, but no shot equals one where we see Howard Spence (Shepard) sitting in a lonely hotel room window overlooking a desolate city street. 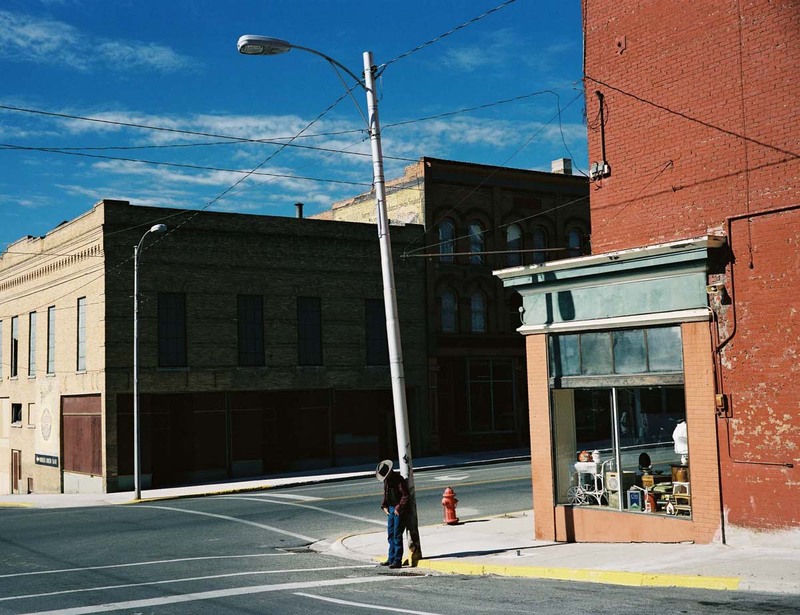 Surely when they framed this shot Wenders, Lustig and Shepard were thinking of Edward Hopper crossed with 'Main Line on Main Street,; the famous photograph by O. Winston Link." For more reviews & info, visit the film page. Sam has been cast in the ESPN original telefilm RUFFIAN, based on the bittersweet true story of the thoroughbred filly considered one of the greatest racers in the game. The horse racing drama is set to premiere on ABC in June 2007, in conjunction with ABC's coverage of the Belmont Stakes, after which it will air on ESPN and other Walt Disney Co.-owned outlets. Sam will play trainer Franky Whiteley, who guides a filly racehorse through the 1970s. Frank Whaley will play sportswriter Bill Nack. Production on the project is expected to begin March 20 in Shreveport, La. Orly Adelson is executive producing the film, penned by Jim Burnstein, Garrett K. Schiff and Ross Parker. Yves Simoneau is on board to direct. I've posted a gallery of photos taken from last week's various events at the Sundance Film Festival, which included the premiere of DON'T COME KNOCKING. Besides Sam and director Wim Wenders, several cast members were in attendance - Sarah Polley, Fairuza Balk and Gabriel Mann. On January 26, a panel discussion called "Writing the West" was held with Wenders and Shepard, and the following day there was a special screening of their 1984 classic. Fascinated by America, Wenders teamed up with Texan screenwriter and producer L.M. Kit Carson about an adaptation of a short story written by Sam. Carson worked on the script, which was later finalized by Sam. The final result would become one of Wenders' greatest films about America called PARIS, TEXAS. In attendance was the film's star, Henry Dean Stanton along with Carson and his son Hunter, who plays Stanton's son. [Trivia: Hunter's mother is actress Karen Black] During the festival Sam related this story of how a woman came up to him after the screening of DON'T COME KNOCKING and asked him, "Have you and Wim Wenders ever worked together before?" Sam said, "She was nice, but I couldn't believe it. I told her, 'well, we made this film some time ago called PARIS, TEXAS.'" Sam's surprise was how this festival goer could be oblivious to the fact that he and Wenders had worked on one of the landmark films of independent American cinema. One would think Sundance would be the one place where everyone would know the film. In the end, Sam was quoted as saying, "I'm glad that it's a cult film. Who wants to make a popular film? Anyone can make a popular film." You're so right, Sam! The Sundance Film Festival opened yesterday and on Tuesday evening, January 24th, it will host the US premiere of DON'T COME KNOCKING. 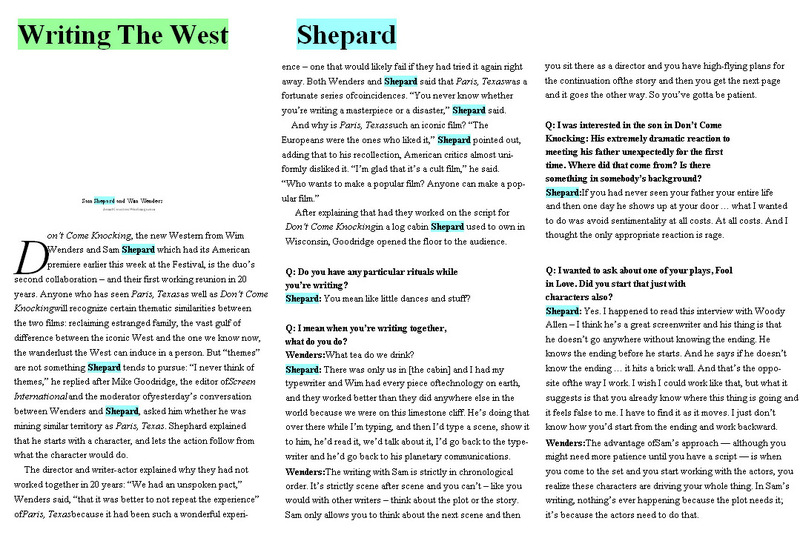 Wenders and Shepard will be attending the festival, and on January 28, the Sundance website will podcast one of its centerpiece panels, "Writing the West" in which the pair will discuss their artistic collaboration on this film, as well as on their independent film classic PARIS, TEXAS. From Curtains UP comes this review on the play's premiere on the London stage: The European premiere of Sam Shepard's THE LATE HENRY MOSS swiftly follows the politically-charged God of Hell at the Donmar. The Almeida's current offering returns to more conventional Shepard fare, to the more insular social phenomenon: the family. Directed by Michael Attenborough, this production continues with the quality theatre we have come to expect from the Almeida: attracting high-class actors, selecting the best writing from around the world and executing it in first-rate fashion. The play itself has been edited down since its first outing in San Francisco five years ago. Judging by my colleague's impression of its otiose length Off-Broadway, this shortened version is an immense improvement. The Late Henry Moss has in fact made the Atlantic Crossing favourably, with its germane significance to universal societies. DON'T COME KNOCKING, which premiered at the Cannes Film Festival in May, has received four nominations by the European Film Academy. They include best film, director, cinematographer and editor. The Award ceremony will take place in Berlin on December 3, 2005. 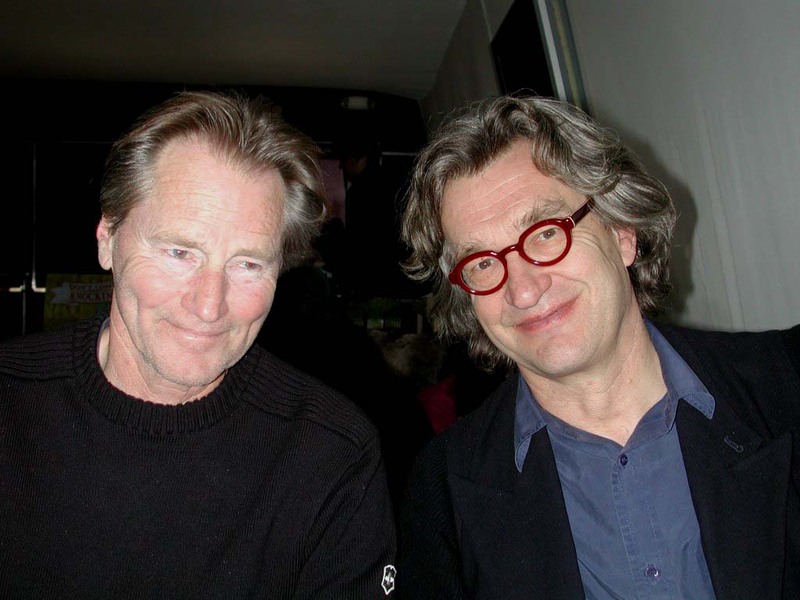 The film was directed by Wim Wenders with a screenplay by both Wenders and Sam. 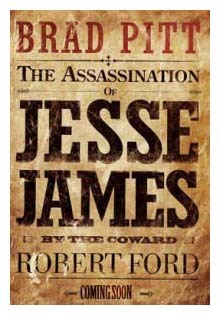 Sam Shepard is presently filming THE ASSASSINATION OF JESSE JAMES BY THE COWARD ROBERT FORD. 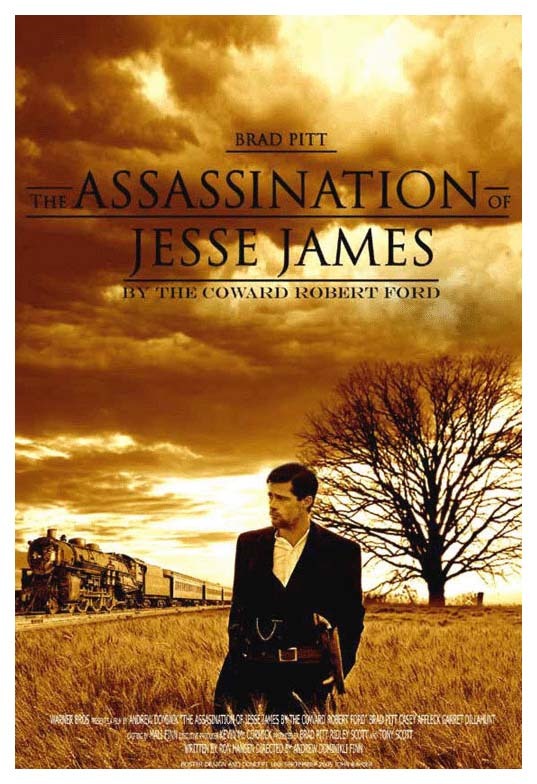 [Wow, that's a mouthful...] The movie tells the story of how Robert Ford (Casey Affleck) joined Jesse James' (Brad Pitt) gang, only to become resentful of the legendary outlaw and hatch a plan to kill James, the fastest gun in the West. Also cast are Mary Louise Parker in the role of Jesse's wife, Zeralda, and Sam in the role of Jesse's brother, Frank. 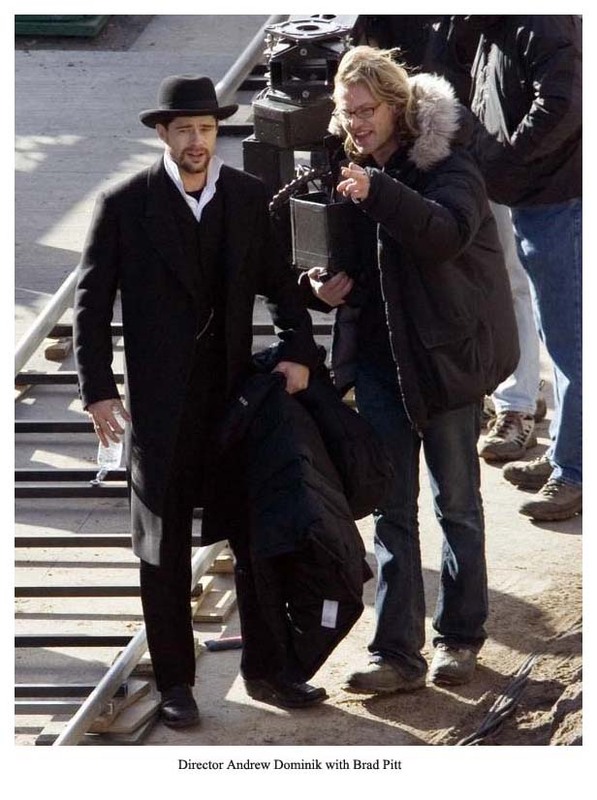 The film, directed by Andrew Dominik and based on the novel by Ron Hansen, is being shot on location in Vancouver, Calgary, Edmonton, Winnipeg and rural Alberta. UK 's Almeida Theatre will present the British premiere of THE LATE HENRY MOSS in January 2006. It will be helmed by the theatre's artistic director, Michael Attenborough, and will open January 19 and run until March 4. Andrew Lincoln and Brendan Coyle will star. The play received its world premiere in San Francisco in 2000 directed by Sam and its NY premiere in 2002. In the play, set near the Mexican border, the Moss brothers, Ray and Earl, return home after a long absence to confront each other, their violent past and the death of their father. Fluctuating between the present and the past, Henry comes to life and re-enacts events leading up to his mysterious death. The European premiere of THE GOD OF HELL took place at Donmar Warehouse in London on October 26, 2005. It will run through December 3rd. Sam's uncompromising black comedy has been described by the playwright as "a take-off on Republican fascism". American dairy farmers Frank and Emma live alone in the American Mid-West, where all is peaceful and nothing of note ever happens. But now their basement has become the dwelling place of a rather strange man, and a government official is knocking at their door. It is time to prepare for a bright, new American future and things are going to start moving extremely fast. The play has been staged this fall in Minneapolis and Chicago and is presently playing this month at the Neptune Theatre in Halifax, Nova Scotia.